People recovering from accidents or disease, or who just want to stay active as they age, call on the skills of a physical therapist to help them manage their pain... grow stronger... and become more mobile. 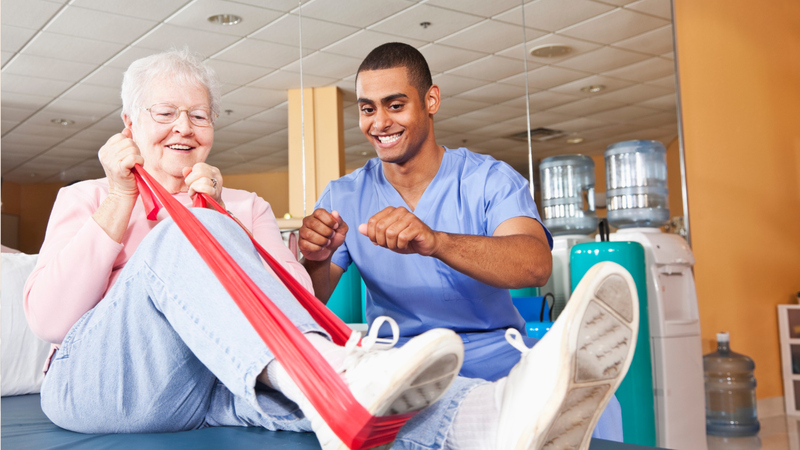 Physical therapists, also called PTs, work with people of all ages who have pain or limitations from a variety of sources, including injuries, amputations, strokes, or illness. PTs design an individualized plan for each patient using exercises, stretching, massage, and hands-on therapy. They also teach patients to use equipment like canes or prosthetics. PTs always review a patients’ medical history before making a plan, then track patients' progress during the course of treatment. Educating patients and their families about what to expect from the recovery process is a critical part of this job. Physical therapists work on a team of health care professionals, and oversee the work of physical therapy aides and assistants. They work in clinics, hospitals, home health care, and nursing homes, and may specialize in areas like pediatrics or sports medicine. Lifting and moving people and heavy objects are all part of the day’s work. To enter this career, you will need a Doctorate of Physical Therapy, and a state-issued license. This field provides the deeply satisfying experience of helping people to regain abilities they have lost, manage pain, and live their lives more fully. See more details at O*NET OnLine about physical therapists. Physical Therapists by U.S. Department of Labor, Employment and Training Administration is licensed under a Creative Commons Attribution 4.0 International License.